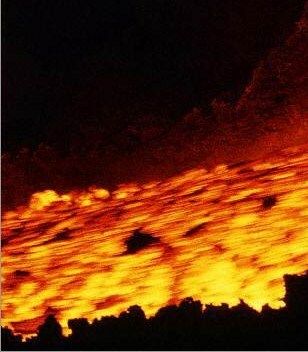 Tropes about molten rock and the like. Island natives try to stop eruptions by heaving human sacrifices into the volcano's crater. If a volcano is shown or mentioned in a story, it will inevitably erupt at some plot-critical point. Adding an erupting or smoldering volcano to a climactic scene for dramatic effect. Lava can only hurt you if you touch it, because molten rock certainly doesn't radiate extreme heat. Adding molten lava to something makes it more visually appealing. Lava is depicted as behaving like superheated red water, flowing far more quickly and fluidly than the real stuff does. Adding volcanism in places where by all rights there shouldn't be any. A pit or moat full of lava helps give a note of extra danger when characters have to cross or jump over a gap in the terrain. The fire-themed video game level. Supervillains like make their lairs inside volcanoes.